Fair point, Mr Bones, but have a look at the analysis on Fr Z's site, through Ed Peters (if you haven't already). It's brilliant and reassuring, while acknowledging the difficulties which so trouble you. Could not footnote 351 mean that there are instances where, after due discernment with a confessor and that confessor having provided absolution, the person presenting himself/herself for Eucharistic reception does not "obstinately persevere in manifest grave sin" or cannot by external and observable signs be deemed to do so; and that they might be seeking nourishment for their weakness? I am thinking, of course, of a person who has contracted a second marriage after divorce. Is not that "obstinately persevere" important? In the context of a second marriage after divorce, in what does such obstinate perseverance consist so that it might be confidently and externally perceived? In some cases, let us say in that of a psychopathic and uxoricidal monarch, the full mens rea may be safely assumed but in a multitude of other cases not so much, or not at all. In any event Canon 915 cannot, by any conceivable construction, have been overturned by a mere Exhortation, as Fr Z's piece shows. Anthony: expletive! Canon Lawyers are a scarce commodity amongst the laity. Quite so. 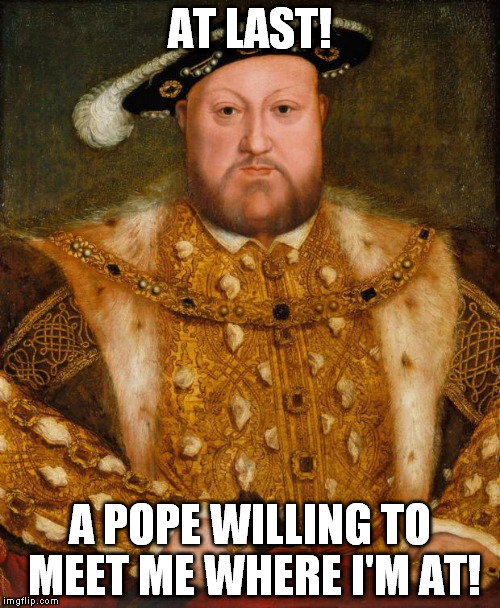 And will Pope Bergoglio retrospectively lift the overly harsh excommunication against the well-meaning Henry VIII? And what will Bergoglio do when he goes to Sweden to celebrate Luther's reform movement? Will he lift the excommunication against Dr Luther? Will he canonise the good doctor? Stay tuned, folks. Who knows what whacky adventures the successor of Saint Peter will undertake next! Note 351: "In certain cases, this can include the help of the sacraments." Some people have taken this to mean just Confession, others just Holy Communion but why not add the sacrament of Holy Matrimony for those who have divorced? Just wait.